1. Wear the breeches or riding tights and socks that you are most likely to wear with your boots. 2. Sit in a straight chair with your stocking feet flat on the floor and knees at a 90 degree angle. 3. For boot width, have a helper use a cloth measuring tape to measure your calf around its widest point. Note: Do not add increments to your calf measurement. The leather of the tall boot will stretch over time until they break in. The boots should fit snugly and should be slightly difficult to put on. If the boots are too large when you purchase them, they will only become looser over time and will increase the risk of the boot dropping too much, resulting in too short a height. 4. 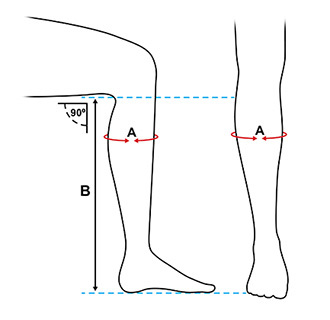 For boot height, have your helper measure from the floor to the back of your knee. Boot height is a matter of personal preference. Some riders prefer a very tall boot, while others prefer a shorter boot. In general, for field boots you’ll want to add 1 1/2 to 2 inches to your height measurement. For a moderately stiff dressage boot, you’ll want to add 1 1/4 to 1 1/2 inches. In addition to these recommendations, check the riding boot sizing chart on the ordering tab for your desired brand of boots to determine whether you should make any specific height adjustments. If you’re choosing a tall boot that is made of very soft leather or that is boxy in cut near the ankle, allow for more drop to occur in the boot. If you want to end up with a boot that has the maximum height for your leg after the break-in phase, take the maximum amount of drop for the boot and add a bit to the height measurement. You’ll have an uncomfortable break-in process, but in the end, you’ll achieve maximum boot height. Note: Styles in both field and dress boots that feature a Spanish top help to create an elongated look as up to 1 to 1 1/2 inches of curved leather is added to the outside of the top of the boot. A Spanish top is cut higher and more curved than a regular boot top. 5. Match your calf width and height measurements to the riding boot sizing chart pertaining to the brand of boot you wish to order. If you’re considering zippered boots, look for a calf measurement that is as close to or a smidge over your measurement to avoid stressing the zippers. If your calf measurement is as little as 1/8 inch wider than the calf measurement listed for your expected size, you may want to consider the next size up or you may have problems with the boot zippers. If the next size up seems as though it will be too wide for your calf and the boot would be too loose, then consider another boot that will fit your leg better. It is not uncommon when choosing from stock tall boots for riders to consider all size charts and all manufacturers to find their optimal boot. Shoe size pertains to your usual size for footwear. Some riders choose to go up a foot size if their desired boot height is not available with their regular size. Extra space in the foot can be taken up with an extra foot bed, gel sole or air cushion. Note: For boots that are offered in whole foot sizes, factor the type of sock you plan to wear into your decision. For example, if you normally wear size 7 1/2 shoe but the boot you wish to order is offered in whole sizes, the thickness of your socks will determine the correct size to order. For heavy, thick socks, you would choose a size 8; for average, thin socks you would choose a size 7.